You are looking at the second rarest of the Zenith tombstones! This is the six-tube version with a workhorse six-tube super-het chassis that plays on both AM and Shortwave. One element which makes the radio ever scarcer is the export version which allowed for multiple tapped voltages to the chassis. This makes the transformer a bit larger and renders a high level of stability to the US current levels. 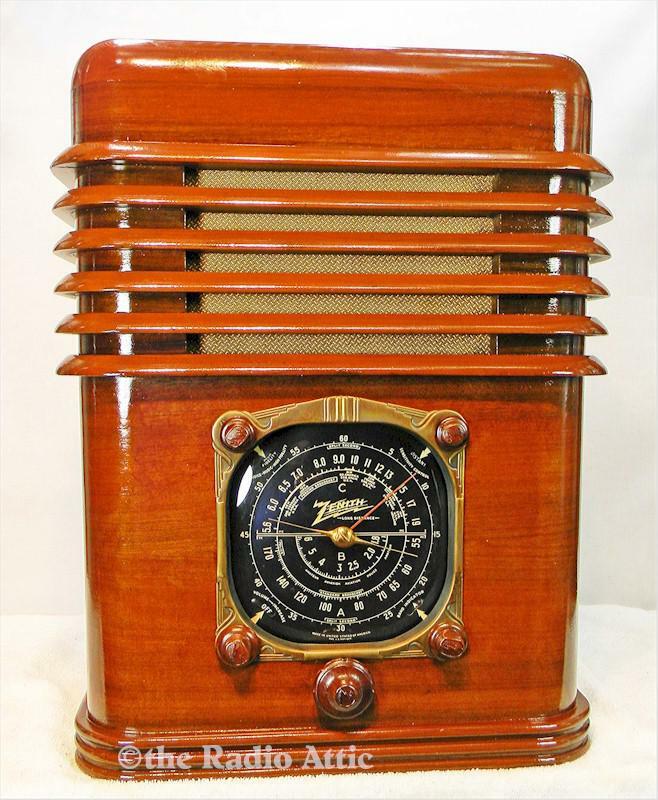 The scale of this radio is massive with the horizontal ribbing skirting the cabinet made out of striped mahogany. The cabinet has been refinished professionally and the radio retains the factory installed speaker cloth and the iconic embossed "Z" wood knobs. Les has completed his professional repairs to the chassis and true to Zenith radios, it plays as well as any radio you might own. Les has added a mini-jack to the circuit, allowing you to input any modern device or stream Bluetooth from the optional Bluetooth receiver. This radio is a sheer delight, only the second one on the Attic in fifteen years, and a real investment grade addition to your collection! 23"H x 18-1/4"W x 14"D.
You are visitor number 2,283 to this page.